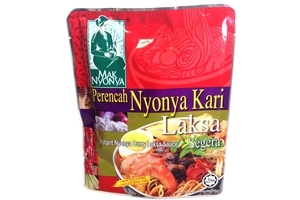 Mak Nyonya Instant Nyonya Curry Laksa Sauce (Perencah Nyonya Kari Laksa) in 7.05oz (200g) pack. Product of Malaysia. Laksa is a popular spicy noodle soup from the Peranakan cuisine, which is a combination of Chinese and Malay cuisine. Laksa is a popular spicy noodle soup from the Peranakan culture, and can also be found in Malaysia,Singapore and Indonesia.CNN Travel ranked Penang Assam Laksa 7th out of the 50 most delicious food in the world. edible oil (palm oil), shallot, garlic, dried shrimps, lemongrass, tumeric, coriander, chili, maize flour, sugar, salt, monosodium glutamate (e621), sodium benzoate (e211).